The principal routes of cocaine administration are oral, intranasal, intravenous, and inhalation. The slang terms for these routes are, respectively, "chewing," "snorting," "mainlining," "injecting," and "smoking" (including freebase and crack cocaine). 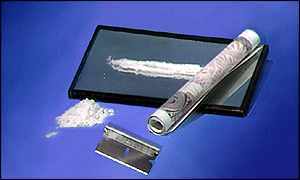 Snorting is the process of inhaling cocaine powder through the nostrils, where it is absorbed into the bloodstream through the nasal tissues. Injecting releases the drug directly into the bloodstream, and heightens the intensity of its effects. Smoking involves the inhalation of cocaine vapor or smoke into the lungs, where absorption into the bloodstream is as rapid as by injection. The drug can also be rubbed onto mucous tissues. Some users combine cocaine powder or crack with heroin in a "speedball."